Camel Up is a dice roll and move, bingo style, family/party game about a camel racing betting in Egypt. The board: The board shows a round race track divided into 16 spaces that camels race on it. At the center of the board is a place for a pyramid which contains dices. At the bottom of the race track is a place to pile up the end of the round (Leg) winner cards and at the corners are places to stack up your bet on overall winner and overall looser. Camels: Wooden camels in 5 colors corresponding to colors of wooden dices. These camels have special cutouts to be fitted on each other backs. The follower camel has chance to go up on the leader camel back on the same space of the race track . The top camel has a higher rank in race track and as the lower camel moves carries all the camels on its back. Dices and the cardboard Pyramid: 5 wooden dices in 5 colors determine movement of the camels with the same colors. At the start of each round (Leg) these dices are placed in the pyramid, at your turn you may decide to take out one of them blindly and place it on the board showing the camel with that color has done its move for the round(Leg). The game will last over several Legs. Desert Tiles: On your turn you may manipulate the dice results by placing your Desert Tile onto a empty space on the track. These Desert tiles have 2 sides one is Mirage that move the trapped camel one space backward beneath the other camels and the other one is Oasis which move the camel one space forward. If a camel ends up on this tile, no matter which side, the tile owner will score one coin immediately from the bank. Leg Winner Tiles:There are 3 Leg winner tiles for each camel color sorted in descending order. During your turn you may want to bet on a Leg winner camel, The first one draw a 5 point tile, the 2nd one will draw 3 point and the third one has to draw 2 point tile. As all the dices have been taken out from the pyramid the Leg is ended and you will score or you will lose 1 coin for each wrong tiles you had been taken. if your tile camel takes the 2nd position of the Leg you will score 1 coin. Pyramid Tiles: On your turn you may chose to roll dice and see what happens as you decide to do it you draw one of these tiles and score 1 coin at the end of the Leg. Overall winner/looser cards: each player has a set of 5 color cards that may bet on the overall winner or overall looser of the race with them. the sooner you bet on the winner you score more money and for each of your wrong bids you will lose one coin. The design is so funny! Camel up is a fun strategy less, easy to teach betting game. The game shines butl lasts longer with more players. They smell, they bite, they spit…Disgusting. Place your bids wisely and decide when it is time to strike, and maybe – just maybe – with a little bit of timing and a lot of luck, your bid will pay off! Witness the craziest camel race of all time, as things really go topsy-turvy when camels stack up and entire pyramids turn upside down. Being the 2014 Spiel des Jahres Winner its pretty safe to say this is a fantastic game, but is it right for you? Being a family game this game is very well balanced and hinges on the concept of luck to keep it fun and exciting for the whole playing group. The game uses 5 coloured dice (with faces numbered only 1-3) to represent the speed of its respective camel. Each leg of the race camels move based on the outcomes of these dice, but the order that the dice come out adds a crazy amount of randomness that really helps the game avoid becoming stale. A lot of gamblers would tell you they ‘have a system’ but lets be honest, games of chance are just that, games of chance. In Camel Up, coming in with a preconceived notion of what is going to happen is laughable, the game has such a charming sense of wackiness that throws strategy almost completely out the window! If you are looking for a deep strategy game, this isn’t that. True to fashion, this magnificent family game is simple while still offering all the fun and excitement of other games. In Camel Up you are going to be taking one action at a time, trying to get lucky and pick the winner and get the most money while trying mitigate any losses. If you want something that the whole family will be able to understand, this is a great option. You will probably get an average of 2 games of Camel Up per sitting, this isn’t a party game like One Night that will have to playing again and again but more often than not 1 really wont be enough. The game has quite a lot of legs (sorry about that) so it will be staying in my collection for quite a while, but if it does begin to get stale, there is a fantastic modular expansion that adds to the fun while still keeping the game easy to understand. This game is gorgeous, from the beautiful wooden camels to the thick cardboard tiles, nothing has been left untouched by a lick of polish. The standout would be the pyramid which not only serves as a centrepiece for the race, but also doubles as the delivery system of the 5 dice that are used to move the camels. It does lose the tiniest amount of points for the difficulty sometimes found when trying to release only one dice from the chute. This is one of those, learn while you go games, as long as players understand the 4 options they have in there turn and what those actions do and how they progress the game this is a very easy game to learn. The biggest hurdle to get over is some players preconceived notion that they need to be bettering with there coins on the fly, which is understandable in a game based on track racing. Camel Up is for 2 to 8 players but the game shines at 5-6 players, any less and you begin to realize there are other options better suited to the player count. When you increase or decrease the amount of players the game doesn’t really change all that much, which is the benefit of the game not having to designate any 1 camel to a single player. Theme? Well you are betting on camels running around a track, nothing really out of the ordinary here. Well except for the fact that these camels seem to not understand how to go around each other and instead opt to jump on top of there backs. While there isn’t much else in terms of story, there really isn’t a need, the excitement comes from losing yourself in the wackiness of it all. Camel Up is a fantastic family game that I think everyone should invest in. If you are looking for something a bit simpler that you can get the whole family behind, this is a definite ‘must buy’. I was looking for a fun (not just heads-down, deep-thinking), relatively short (30-45 minutes), interactive, simple game for up to eight players and came across Camel Up. After playing for the third time in one evening with our gaming cohorts, my wife said, “This is the most fun we’ve had with any game we’ve played in quite a while!” And I completely agree. It is witty, it is exciting, it is strategic, it is filled with luck, and it’s a blast. There are five camels racing around the track. Each player is a bettor. One of four actions can be taken each turn: roll a die to move a camel, bet on the winner of that leg, place your oasis/mirage tile, or bet on the overall race winner/loser. That’s it…but there is oh, so much more! This is my favorite aspect of the entire game: if a camel lands on the space of another camel, the moving camel is stacked on top of the other and is then higher ranked than the first. If the camel at the bottom of a stack is moved, all camels on top of that camel move with it and remain ahead of the moving camel. If you think about it, there is a lot that this implies. It muddies up the relatively simple betting world and adds an incredibly fun twist. If a camel lands on an oasis tile, the player who laid the tile gets an Egyptian Pound (have the most at the end of the game to win), and the camel moves forward one space (and takes the lead if stacked). However, a mirage tile will move the camel back a space and underneath any existing camels. Use these tiles carefully to pull in a good stream of earnings while furthering or hindering camels depending on your bets. Another really cool feature of Camel Up is the die-rolling pyramid. You put all five dice inside this pyramid at the beginning of each leg. When a player chooses to move a camel for his action, he takes the pyramid, gives it a little shake, flips it upside down, pushes the slider which only allows space enough for a single die to be released, then lifts it up to reveal the die. My 10-year-old nephew rolled almost every time because he thought it was so fun just to use the pyramid. The most fun comes when all eggs are placed in one basket, someone flips over the pyramid to roll a die, everyone is muttering something like, “Come on…come on…yellow 2…yellow 2…,” followed by yells of success or groans of failure. =-) It is a very fun game which I give a solid 8.5. The game has interesting components, yes the main attraction is the dice shaker with pyramid-shaped boards assembled together. So when you displayed your game on the table, many passerby will check that component first. In the game we, players are in the Camel Race, watching and of course betting which Camel is going to win, or lose. There are 5 camels (in different colors and each of them has a single die of the same colors). These camels will be on the race and you will bet which camel is going to win and which is going to lose. A single race consists of one lap (you can set as many laps as you want though) and in it there will be several legs. One leg is done if all the camels already moved. So once the race starts, each player from the first player will take turns to take an action. The available actions are roll a die, take a wage, place an oasis or mirage tile, place a bet on the lose and win camel. If the player take a roll die action, he will take a pyramid tile and shake the pyramid, place it upside down, push the lever and reveal the laid die to determine which color and number the die has. The camel of the same color will move on the track a number of spaces depends on the die value (from 1-3 spaces). If the player take a wage tile, he choose which color he wants to take and take the top tile. Each color has three tiles of different value, from the biggest value of 5, 3 and 2 coins for the first place. So by taking this action, that player place a wage on that camel to win (or at least in second place). The other action is to place a tile on the track. Each player has a double sided tile, which showing an oasis on one side and a mirage on the other. They can place this tile on an empty space on the track (without camel or tile) with one of the two faces facing up. If it’s an oasis, it will give +1 movement space to any camel stop on top of it (and the owner of the tile will get a coin if that happened). If it’s a mirage, any camel stop on top of it will get a -1 movement space (move backward) and the owner also get a coin. The last action is playing a card of a specific color (each player has 5 camel cards, each showing a color) to bet on the first and last place when the race ends. They will get huge rewards if they managed to bet on the right camel. Once a leg finishes, the players check their wage tiles and get rewards or pay the losing bet. And a new leg will then start again if no camel reach the finish line. Once a camel reach the finish line the game immediately ends. Check the wager rewards and the betting for last and first camel on the race. It’s a fun and light game, party if you need to say, a beer and pretzel game. All you have to do is choose an action each turn, that action can depends on your certain considerations on that time, but seriously, everything is luck fest of the dice roll. Of course you can make a good move, this means not doing something obviously impossible (for example wagering on a camel that’s impossible t win the leg at that moment). So, let’s take a moment to rest and relax, let your wild side get the best of you and enjoy the race. Winning is exaggerated. The components are good, but main concern is the rubber band that holds the pyramid lever. The game comes with 3 rubber bands I guess, but when I assembled the pyramid for the first time, the first rubber band was snapped. So I used the second, but recently the second also snapped and right now I am using the last one. So just hope this will last for some time now. Of course you can use any rubber bands to replace this component, but I don’t know how good the common rubber band is compare to the original one. Camel (c)up is basically a gambling game where you are watching a crazy camel race. The race is played in some legs untill a camel reaches the finish, the race can be very surprising because of the camel stacking. You have an option to influence the race a bit (desert tile), but that’s all. The pyramid stands out as a surprise-dice-rolling-box, the camels are funny. The rules are simple and well explained, easy to learn and teach. This is a quick and fun game, it looks all about luck, but understanding probability can be a winning strategy. Kids will love the game, but it’s also entertaining for adults. I had surprising outcomes and more predictable ones, so the replayability is reasonable. The more players the more fun, but with large groups (6+) it can be frustrating because the leg might be over before you could do something. This is just a well-made funny game with some surprises, play it with your family or friends, and have a laugh! Camel Up is a betting party game. Rather than controlling a single camel through a race, players try to earn coins as they bet on different camels throughout the race. The game is played in legs (each leg ending when all camels have progressed via random dice roll) and the placement of each camel can change vastly from leg to leg, each player is kept on their toes and may have to change strategies halfway through a leg. Several rounds can be played easily in one sitting! A great game to bring out the gambler in you. Betting on imaginary camel races is more fun than you might think. With their movements controlled by dice the outcomes can be quite surprising. Nothing like that surprise sequence of dice rolls to get everyone playing the game yelling and cheering. This may be a weird thing to include in a review but their dice rolling mechanism is……. GENIUS! My only complaint is that you will find that the incentive of 1 coin for a player to use their turn to make a roll is not enough. I have tried adjusting it to 2 with some friends but it still doesn’t feel like the right amount, maybe 1.5 would work if there were half coins. 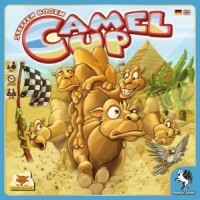 Add a Review for "Camel Up"